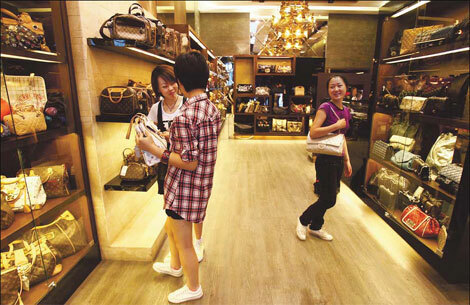 A survey confirms China's luxury goods buyers are young and keen on pampering themselves. Gan Tian reports. Lu Jing is 22 and works at a Shanghai-based advertising agency. She earns less than 6,000 yuan ($943) a month but is the proud owner of a 20,000 yuan Louis Vuitton (LV) bag. She says she lived on instant noodles and took buses instead of the subway to save 5-yuan a day in order to buy her dream bag. Lu's American colleague, Niki Anderson, who has been interning in Shanghai for the last four months, notes that almost every young woman in her office owns a brand name bag - but thinks brands like LV are old-fashioned. Anderson's observation reflects a point highlighted in the 2011 China Luxury Forecast, a survey mainly examining China's "post-1980 generation" luxury consumers, predicting future trends for China's prestige market. This is the third consecutive year public relations firm Ruder Finn Asia and the market research institution Albatross Global Solutions have conducted such an analysis. The focus of this year's survey is in line with China's luxury industry profile, where the majority of buyers are aged between 20 and 30 - significantly younger than their counterparts in Western countries or nearby Japan. The two companies polled more than 1,000 luxury consumers from Beijing, Shanghai, Guangdong province's capital Guangzhou, Taiwan province, Hong Kong and 17 second-tier cities on the mainland. About half of the respondents were aged between 20 and 30, and earn an annual income of less than 180,000 yuan. One of the significant findings of this year's report was that 60 percent of young Chinese luxury buyers were prompted by "self-oriented triggers", such as pampering themselves. "Showing off" (a key motive for buying luxury products) was less important and moved into second position in 2011. Post-1980 consumers were also more open to luxury online shopping, with 35 percent of respondents saying they bought luxury products online. Among the more popular marketing avenues for international luxury brands is Sina Weibo, China's most popular micro-blogging service. French jeweler and watchmaker Cartier has more than 220,000 Weibo followers - 90 percent of whom are under 30 years old. In its latest online campaign, Cartier invited Taiwan TV star Kevin Tsai to promote the brand, and his words were retweeted more than 500 times in a day. Another brand, Swatch Group, which owns 19 watch labels including Omega and Breguet, opened the Swatch Art Peace Hotel in Shanghai last month. The event was broadcast live by Weibo users, with more than 1,500 users tweeting about it on the same day. The group's CEO, Nick Hayek, says he was surprised at the increase in the number of young Chinese consumers, who have become so sophisticated. LV chairman and CEO Yves Carcelle said during the brand's exhibition at the National Museum of China: "We started in China nearly 20 years ago. It's now a brand-new generation to whom it's also important to tell how the past of Louis Vuitton explains the reality of today." Some of these young consumers, however, are blamed for damaging the image of luxury brands. For instance, 20-year-old Guo Meimei showed off her Hermes bags and her 2.4 million yuan ($377,093) Maserati on Weibo, but was later caught up in a charity funding scandal. Several months later, You Yixi, 19, emulated Guo by showing off her LV travel bag and Hermes handbag on Weibo, too. As a result, products from these two labels were condemned by netizens. "The two young girls brought damage to the image of these labels in China," says Elan Shou, managing director and senior vice-president of Ruder Finn China. Even so, LV still topped the list when it came to the popularity of bags in the 2011 China Luxury Forecast, while Hermes ranked fourth.